People are reaching out to help the “blue dog” from Serbia, and as a result others like him will have a chance at a better life. The dog, who has been named Babe, was found a few weeks ago covered in blue paint. People are reaching out to help the “blue dog” from Serbia, and as a result others like him will have a chance at a better life. 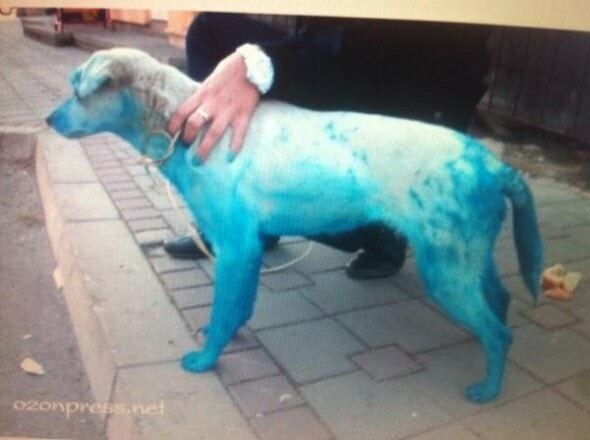 The dog, who has been named Babe, was found a few weeks ago covered in blue paint. It is not known whether he got that way intentionally through abuse, or accidentally while rummaging for food in the garbage but it left his skin sore and itchy. That’s when the Harmony Fund international animal rescue charity came in to assist Babe by making a donation to help in transport of Babe to an animal sanctuary in Kent, England. They didn’t want Babe to go alone though, so they made him a mascot of sorts “The Blue Underdog,” for a campaign to help street dogs and cats throughout the Balkans. Money is now being raised to transport other dogs to places where they are more likely to be adopted. Thanks to all the help from the Balkan Underdogs and the Harmony Fund, Babe no longer whimpers alone in a doorway, now he has a strong confident bark and knows what it is to be loved. He will have a new life soon, with a new family, but his legacy of helping other lonely and abandoned dogs will carry on. To get involved in helping homeless dogs and cats throughout the Balkans, visit the Harmony Fund. Yea, but what is worse, they spent the time and money to neutered and vaccinated and then put back on the streets to fend for himself? That’s smart but at least he wasn’t PTS. That is good.